Molecular weight refers to the mass of a molecule relative to its constituent elements. This is mathematically determined by multiplying the atomic weight of each distinct atom within the molecule by the number of atoms within the overall compound or molecular chain. Numerous industrial, academic, and commercial sectors require robust molecular weight analyses to ensure products are fit for application. The molecular weight of comparatively large molecules such as proteins and antibodies are typically assessed using optical light scattering measurements. The DelsaMax series of dynamic light scattering (DLS) instruments have been used for the study of biological molecules as small as 0.4 nanometers (nm) in sample volumes as small as 1 microliter (µl). The DelsaMax CORE has proven successful in measuring monoclonal antibodies with outstanding accuracy. Ideal for proteins, carbon nanotubes suspensions and emulsions, the speed of analysis means delicate samples such as proteins are not perturbed by the analysis resulting in more reliable and reproducible data. Utilises Dynamic Light Scattering (DLS, sometimes referred to as Quasi-elastic Light Scattering QELS) to determine molecular size simultaneously with Phase Analysis Light Scatter (PALS) to determine Zeta Potential. Using 32 detectors for zeta potential measurement and a separate detector for sizing the DelsaMax is able to measure zeta potential on samples as low in concentration as the equivalent of 1mg/ml Lysozyme. The incredible speed of the analyser comes in part from its 32-detector array, which allows sensitive detection of particle motion in response to the applied electric field. 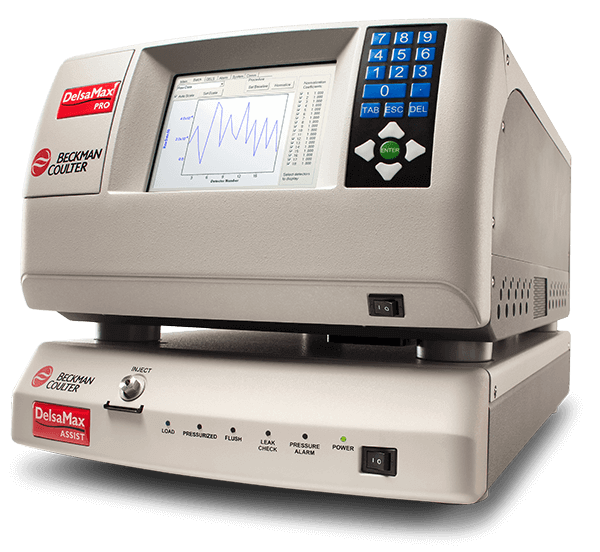 Rapid detection helps prevent sample degradation that can occur in other slower Zeta potential instruments due to the prolonged exposure of the sample to intense electric fields. The Assist accessory provides pressurisation of the measurement cell to eliminate gas bubble formation which further improves reliability and reproducibility on samples prone to gassing. The analyser also utilises a flow cell system requiring only 170 μL of sample, and can be used in-line with industry standard auto-samplers for analysis of multiple formulation samples. For challenging samples with high electrical conductivity that are prone to generating bubbles, the analyser can be used in conjunction with the DelsaMax ASSIST module. Contact us for a quote or to discuss your molecular weight analysis needs.